Fair Isle Bird Observatory: the Warden's diary: Our list is like a Red Rose. The 19th saw the last day of the spell of easterlies that had delivered some good numbers of common migrants, an impressive display of scarcities but just two additions to the year list (Grey Plover and Yellow-browed Warbler) and just one description species (Short-toed Lark). Another good day of birding saw the first Corncrake and Ring Ouzel of the autumn, along with a new Bluethroat, 4 Red-breasted Flycatchers, 8 Yellow-browed Warblers, Little Bunting, Barred Warbler, 3 Common Rosefinch, 13 Jack Snipe and 2 Grey Plover, along with a similar number of common migrants to previous days; so despite the lack of rarities, nobody was complaining at the quality of the birding. 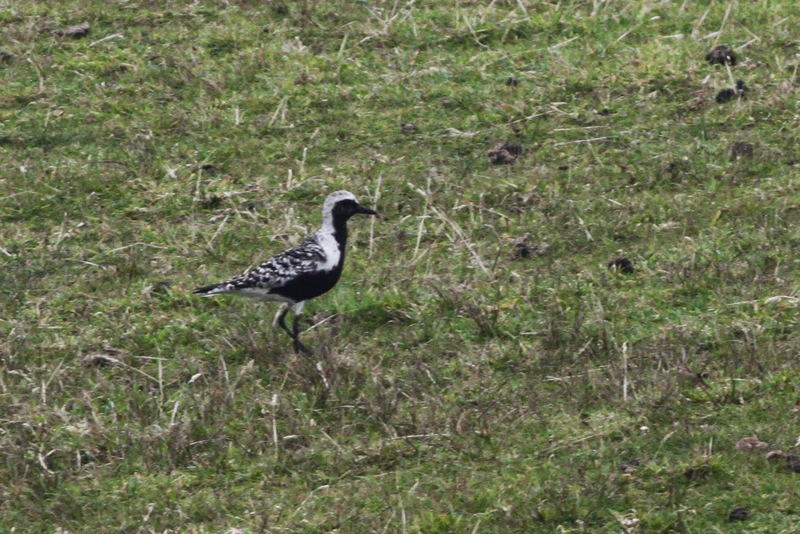 This smart breeding-plumaged Grey Plover has been lingering around the Skadan for a few days. Contrary to what I said earlier in the week, there was a record in 2013 (two flyover birds on 29th September), but 2012 was a blank year, so it's always a good one for the year list. The 20th finally saw the winds change and, although NW is not a direction usually associated with good birds, it often happens that on Fair Isle a switch in the wind direction delivers something good. The early signs were interesting, with a skein of Pink-footed Geese heard over the Obs in the morning entirely expected given the weather, but three new Yellow-browed Warblers trapped in the garden were less predictable. Three Yellow-browed Warblers in an hour was a good return for the morning's ringing efforts. This was one of two trapped the previous day (photo: Ciaran Hatsell). 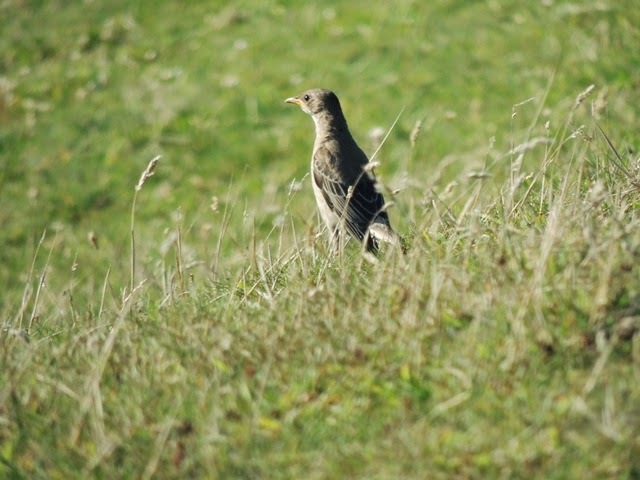 It wasn’t long before the first new good bird was found, when a juvenile Rose-coloured Starling was discovered near Steensi Geo before setting off on a wander of the south of the island. Rose-coloured Starling. Just the second since 2008, with an autumn juvenile in 2011 the most recent record (photo: Ciaran Hatsell). The rest of the day produced another good spread of migrants, although mostly lingering birds with 2 Bluethroats (at Barkland and Quoy), Little Bunting (still at Lower Leogh), 2 Red-breasted Flycatchers, 7 Yellow-browed Warblers, 2 Common Rosefinch and the Gadwall reappeared. There was also the first Grey Wagtail of the autumn, but most common migrants decreased in number. By 5pm, the wind had increased, people were drifting back towards the Obs and thoughts were maybe starting to veer slightly from birding to eating, until a ‘red’ was added to the ‘rose’ for our list of highlights for the day, appropriately enough by our very own Lancashire lad Ciaran, when he found a rather smart Red-throated Pipit (maybe not a BB rare anymore, but rare enough nowadays to warrant the red font I think) in the Setter tattie rig. Although elusive at times, everyone was eventually able to get decent views and we were just about back in time for dinner; another good Fair Isle day. 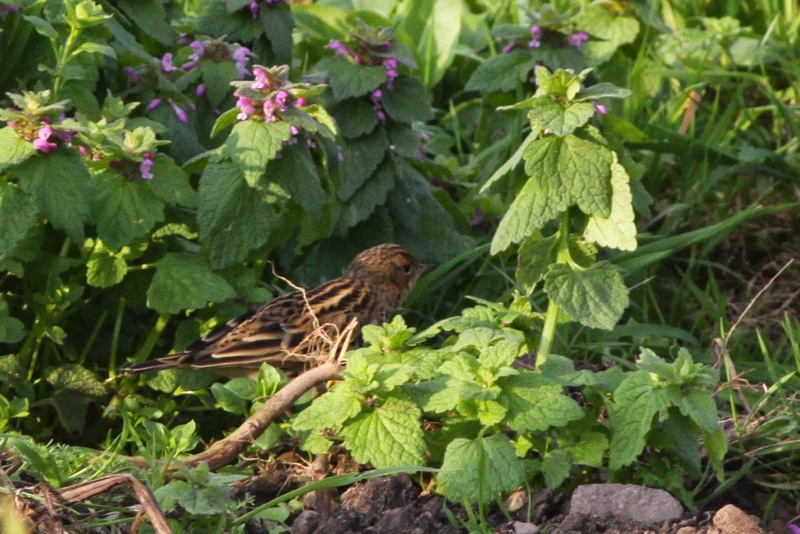 The Red-throated Pipit being a bit elusive but showing off several of its main identification features (pale-based bill, mantle stripes, lack of primary projection, streaked rump). There were none in 2011 and 2012, one in autumn 2013 and this is the first of the year, reflecting a change in fortunes for this formerly regular spring migrant. It was the second quality addition to the year list on the 20th, taking us to 202 for the year so far.